Whether fire is from a lamp, candle or other means, it has only two functions: to burn and spread brightness. It is up to us and our vivek (discrimination) on how and where we utilise it. This same fire can cremate a human body whilst it can also get rid of darkness and spread brightness in the entire world. Utilising the same thing can lead to a good deed or a sin. It is not necessary to curse or complain about anything, person or circumstance in this world. Instead, it is necessary to understand the qualities, nature and disposition of these and use it for the welfare of the society. The world is very beautiful. 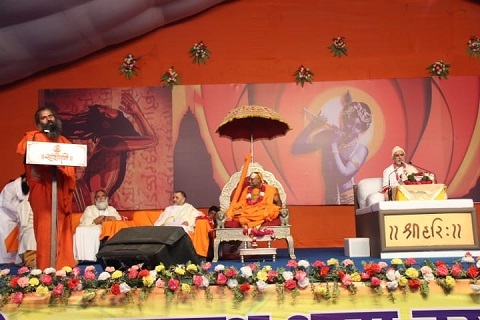 True Yagya is to make it even more beautiful through our discrimination, thoughts and virtuous actions. When a mother raises a stick to punish her child, her aim is not to truly beat up the child, but to instil slight fear in her child in order to deter the child from doing something wrong. Similarly, the punitive code in our scriptures does not intend to terrify or scare one, but to instil slight fear in order to deter one from going onto the wrong path in life. The duty of the scriptures is not to scare, but to prevent life from disorder and anarchy. Scriptures are like a whip to humans who have become animal-like, to encourage them to come to the right path again and again. The aim of scriptures in not to scare you but to free you from fear. Scriptures are not to use as an ornament in the house, but to implement in our life and make our actions/deeds splendid. Hence, do not fear our scriptures. Walk on the path guided by them so that a defensive weapon is not required to make you understand the right from wrong. What does Ananyatā (exclusivity/oneness) in God mean? You must have heard of the word Ananyatā, meaning oneness or exclusivity. Ananyatā means no expectations from any deity except the one who you firmly believe in (known as iṣṭadevtā). 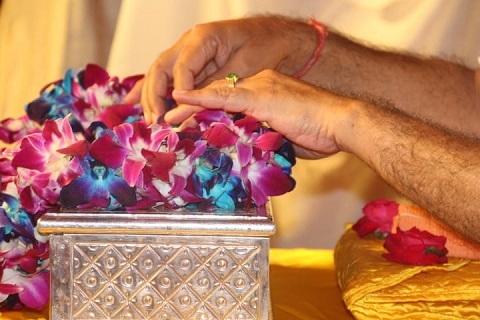 It also means firm belief, faith and surrender in your main deity of worship. We must be patient regardless of the circumstances we are in: happiness, sorrow, wealth, difficult times and so on. Patience is necessary with Dharma (righteousness). Bhajan (worship) is trust in God. Ananyatā means not longing for others instead of your main deity of worship. Shri Krishna says in Bhagavad Gita that those who have exclusively taken refuge in me, I give them what they do not have and protect what they possess. Ananyatā means no expectations from other gods, it does not mean ignoring or disrespecting other deities. 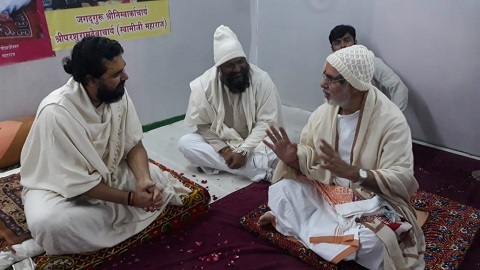 Pujya Bhaishri and other saints including Shri Bhagavat Mohanji, Pujya Maharaj Shri, Pujya Muniji, Pujya Yoga Guru Ramdevji, Shri Pundrikji, Sant Bhupinderji, Sant Shri Parmatamanandji and Jain Muni Lokesh Muniji attended the ‘Sant darshan’ play on the occasion of the 70th birthday of Pujya Govinddev Giriji at Prayag, Kumbh.